Paris St-Germain saw their 16-match winning run end in a 0-0 draw with struggling Lille but still remain unbeaten in Ligue 1 this season. Laurent Blanc's side failed to win for only the second time in 22 games. Paris were without top scorer Zlatan Ibrahimovic and rested a number of other players ahead of their midweek Champions League tie with Chelsea. 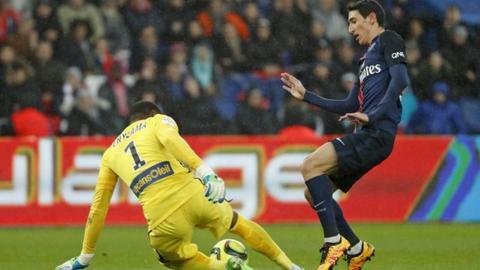 They lacked a cutting edge as Lille became the second team to avoid a league defeat in Paris this season. Match ends, Paris Saint Germain 0, Lille 0. Second Half ends, Paris Saint Germain 0, Lille 0. Attempt blocked. Lucas Moura (Paris Saint Germain) right footed shot from outside the box is blocked. Hand ball by Junior Tallo (Lille). Offside, Paris Saint Germain. Lucas Moura tries a through ball, but Layvin Kurzawa is caught offside. Foul by Benjamin Pavard (Lille). Attempt missed. Marquinhos (Paris Saint Germain) header from the centre of the box is high and wide to the left. Assisted by Lucas Moura with a cross following a corner. Corner, Paris Saint Germain. Conceded by Morgan Amalfitano. Foul by Benjamin Stambouli (Paris Saint Germain). Djibril Sidibe (Lille) wins a free kick in the defensive half. Vincent Enyeama (Lille) is shown the yellow card. Attempt missed. Lucas Moura (Paris Saint Germain) right footed shot from the centre of the box is just a bit too high. Attempt missed. Edinson Cavani (Paris Saint Germain) left footed shot from the left side of the box misses to the right. Assisted by Benjamin Stambouli with a through ball. Foul by Renato Civelli (Lille). Jean-Kevin Augustin (Paris Saint Germain) wins a free kick on the left wing. Marvin Martin (Lille) is shown the yellow card for a bad foul. Benjamin Stambouli (Paris Saint Germain) wins a free kick in the attacking half. Foul by Marvin Martin (Lille). Substitution, Lille. Benjamin Pavard replaces Sébastien Corchia because of an injury. Offside, Lille. Renato Civelli tries a through ball, but Junior Tallo is caught offside. Delay in match Sébastien Corchia (Lille) because of an injury. Sébastien Corchia (Lille) wins a free kick in the defensive half. Substitution, Lille. Morgan Amalfitano replaces Florent Balmont. Substitution, Lille. Marvin Martin replaces Yassine Benzia. Renato Civelli (Lille) wins a free kick in the defensive half. Delay in match Éric Bautheac (Lille) because of an injury. Lucas Moura (Paris Saint Germain) is shown the yellow card for a bad foul. Renato Civelli (Lille) is shown the yellow card.